As Tank' Goodness the Wall came down, so now everyone can Dine at the "golden Arches" in Der Fatherland, Ja-Ja! As seriously? Thee Donald went thru the MicDugalz' Drive-thru; As I'd like 100 Whoppers! Sir this is Mickey D's... Ok, then how 'bout 100 Big Macs, 100 Quarter Pounders, Fries and Oh Yeah, can I get Dat' super Sized? Does everything look correct on the Screen? That'll be $186.69 at the first window... What's that? Oh you wanted some Chicken McNuggets with your order, Sir? Once again here on thou Isle 'O Nofendersville, I'm struck by thoust foaming Seas of Synchronicity, as I'm currently listening to another CD Audiobook. Being the final volume of Ken Follett's excellent Century trilogy, the Edge of Eternity, which just so happens to begin by taking place in east Berlin, circa 1961. Denoting the Overt Ruthlessness of the Stasi, the Vicious East German Secret Police and their Barbarically Brutal Enforcement Tactics, and how Civilians Chilled over the mere thought of being summoned to Stasi Headquarters for a "Simple Chat." As Follett's most Excellante Century trilogy begins with the beginning of World War One, then thru WWII and then the "Cold War" and the Civil Rights movement of the 1960's. Whilst certainly Y'all know what happened in the Summer of '61, Righto? As that's the year that Nikita Khrushchev authorized East Germany installing The Berlin Wall! Which also became known as thee "Iron Curtain." As how many people were Killed, Maimed or Seriously Injured over nearly three Decades of Subjugation by the East? And for what ultimate purpose? As we should All know, the Berlin Wall was Erected on August 13, 1961 to Halt the flow of East Germans "Escaping;" Err migrating to the West for better pay and ultimately a better lifestyle! Most notably the Freedom of Choice in All aspects of life, with an estimated 3.5 million citizens fleeing before the Wall's installation. 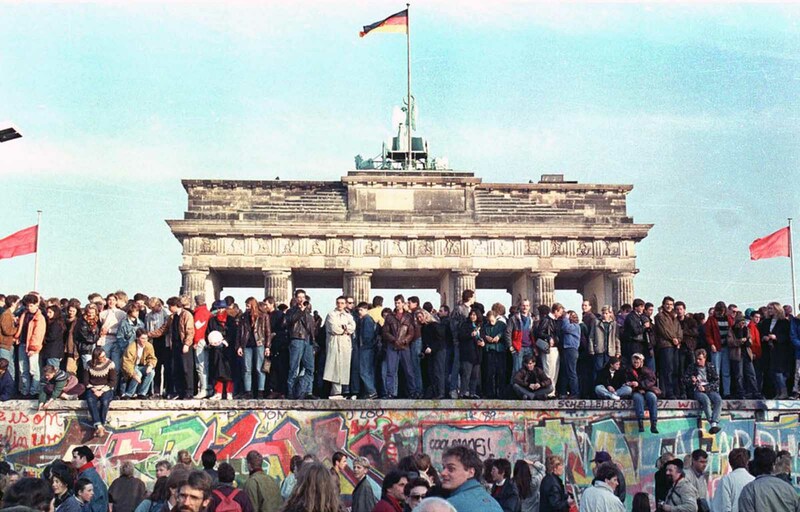 As thou Wall Stood Menacingly for some 28+ years before the German Democratic Republic (GDR) finally succumbed to the Tyranny 'O Freedom, and opened passage thru The Wall to its population on November 9, 1989, with Germany being reunified, beginning on October 3, 1990. As I've previously read two fascinating Books upon the subject of Berlin, which I highly recommend. Giving a vastly intriguing perspective upon the Harshness German Citizens endured for several decades. Yet before The Wall was erected, there was a previous tussle over Germany, which perhaps Y'all recall the Berlin Airlift of 1948? When another Russian leader named Stalin thought Harry S. trueman was a weakling, apparently never hearing of his campaign slogan: "Give 'em Hell, Harry!" As it wonderfully chronicles the originally unknown American volunteer Airman Gail Halverson, who upon visiting a flock of German Kids behind Tempelhof's Airfield fence, told them he'd drop them candy the next time he flew into Berlin. But how will we know your plane one asked? I'll Wiggle my Wings, to which the child immediately asked in broken English, What is Wiggle? As Halverson would become fondly known as "Uncle Wiggly Wings" when the Americans and Allies furnished the Germans with the necessary supplies to survive the Russian Blockade. Next, the second book I listened to was Berlin 1961: Kennedy, Khrushchev And the Most Dangerous Place on Earth, by Frederick Kempe. (2011) As its title is pretty self-explanatory, but explains the nuances of how the two Super Powers leaders dealt with Berlin, and their Tug 'O War over Communism vs. Capitalism. "Freedom has many difficulties and democracy is not perfect. But we have never had to put a wall up to keep our people in -- to prevent them from leaving us"
Alas, although I've never contemplated this before. Perhaps? Was it just CoInky-dense' that thee Berlin Wall was erected on august 13, 1961. exactly one week after the 1961 German Grand Prix was held at the legendary Nurburgring. Whilst a further irony would be the two main rivals for that year's formula 1 Driver's World Championship being an American vs. a West German during this Ultimate Crisis, Ja volt! While it's also funny to Mwah, how even though I began following Formula 1 two years before the Wall's Demise. It was that very same year when some Cowboy Movie Star implored Mr. Gorbachev to Tear Down the Wall! Along with living through it as a young motor racing lad. I'm struck over how just now, today with the realization that I've never classified German Drivers and Teams as West Germans in my 30+ years of following Formel Ein. Not until 2016, Down Under in Bloody OZ', when Pascal Wehrlein was elevated from winning the DTM, to Marussia F1; Err Manor Racing with the backing of Mercedes Benz, was there a German on the F1 Grid hailing from Unified Germany. As Wehrlein hails from Sigmaringen, which is in Southern Germany. With Tis Land 'O Thee', having been Born some 242 years ago, and never having had a Wall along its Borders, HELL! Yuhs Didn't even need a Bloody Passport to visit North of thee Border, Oh KanaDuh! Or Viva la Mexico until the implementation of the Western Hemisphere Travel Initiative on January 23, 2007! Thus, I simply ask, why do we need a Wall now? And do we really wish to become the new Israel? Not to mention, who's gonna clean All of Somebody's Hotels, Mow the lawns and keep the Greens Manicured, et Al Mr. President? And I haven't even touched upon the Sickening Plight of our National Parks et Al, for which regardless if you're Republican or Democrat. Thars' Absolutely ZERO reason for Destroying our Natural Resources, i.e. ; Decimating the Joshua trees, etc. Henceforth Donald, as 'Ol Ronnie said: Tear Down This Wall! And Quit keeping the U.S. Government shutdown, as there's so MANY More Important things needed in our Country! Just Say NO to The Wall, Donald! Or even better yet Donald, in the Immortal Words 'O Don Henley; "Get Over It!"